From Goodreads: Risking his reputation and career, Detective Constable Tom Henson takes Charley to the scene of Kerry Underwood’s death. Charley is still convinced that what she has seen in her flashes proves that Kerry’s death was no accident but the work of a serial killer. 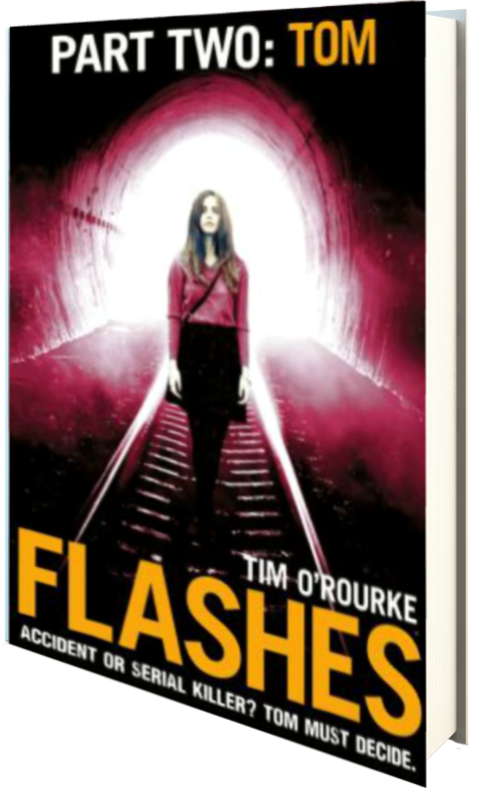 In this second part of O’Rourke’s serial, the focus shifts from Charley, the girl who can see past events through a succession of flashes, to Tom, the young police recruit intent on finding the truth in time to stop a killer. Struggling to fit in and make the higher ups believe him, Tom makes a series of rash decisions, which costs him both his credibility and his standing within the police force, and as the story unfold, readers once again find themselves wrapped up in the mystery of it all. While all evidence seems to point to a single suspect, knowing O’Rourke’s writing, it’s safe to say that all bets are off when it comes to the truth, and while it may seem like certain people are guilty, I know O’Rourke is going to drop a bombshell on readers in the third and final installment, and I can’t wait. This second portion of the serial was indeed great fun, and I’m beyond ready to find out what happens next. Five stars. The full length novel encompassing all portions of this three part serial should be releasing soon.